Following months of negotiations and much-publicised problems, the government has finally come to terms regarding a new tax agreement in co-operation with Dansk Folkeparti (DF). The agreement, which will provide tax easements of 5 billion kroner in total, includes reducing the basic tax rate by 0.02 percentage points and increasing the incentive to work instead of remaining on social benefits. “The unemployed will see greater benefits to work, and in the future low-wage Danes will save more for their pension,” said finance minister, Kristian Jensen. 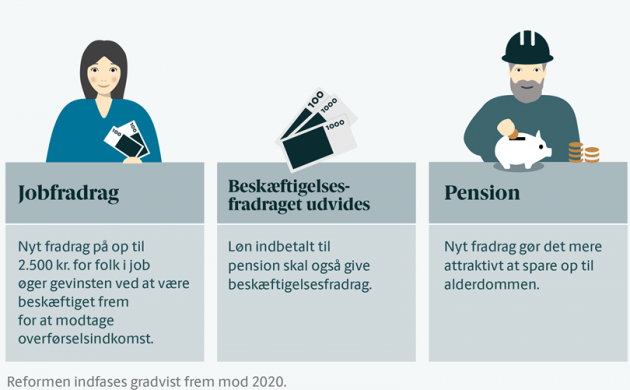 Other key points of the agreement include tax breaks for people who earn less than 350,000 kroner (pension not included), while earnings paid into pensions will also be encompassed by the employment deduction (beskæftigelsesfradrag). A new job deduction of 4.5 percent of income over 187,500 kroner per year – up to a maximum of 2,500 kroner – will also be ushered in, as will a new pension deduction. Moreover, the maximum beskæftigelsesfradrag attained will be increased by 1,000 kroner to 38,400 kroner. The road to the tax agreement has been treacherous at times. Just before Christmas, government party Liberal Alliance (LA) announced that a “historic agreement” had been reached that would yield tax reductions totalling 23 billion kroner by 2025. But DF dug its heels in and, while LA threatened to leave the government if certain demands were not met, the deal has ended up being considerably smaller.